The award recognizes Siebenmorgen’s career-long research to improve post-harvest rice processing. CAREER OF SERVICE -- Dr. Terry Siebenmorgen received the Distinguished Service Award from the Rice Technical Working Group for his contributions to post-harvest food production in rice. He is shown here with Jean-François, left, interim director of the Arkansas Agricultural Experiment. Siebenmorgen’s research and outreach program has focused on rice process engineering. The scope of his work ranges from preharvest property characterization, through drying, storage, milling, and end-use quality evaluation. Often describing himself as an agricultural engineer, Siebenmorgen has crossed the lines of scientific disciplines to paint a complete picture of what goes on during rice processing. Using an integrated approach that involves polymer chemistry, cereal chemistry, and crop physiology, Siebenmorgen’s research has improved understanding of the development, composition and processing behavior of individual rice kernels. He developed and tested the “glass transition hypothesis” concerning how rice kernels change in physical and chemical structure because of heating during drying. Subsequent research showed that under certain conditions, this process can lead to some kernels fissuring and then breaking during milling. More precision in harvesting rice at ideal moisture content and adjusting drying methods led to greater milling yields and improved food quality and value. Among other revelations, Siebenmorgen’s research showed that pre-harvest conditions, such as high highttime air temperatures had an impact on post-harvest quality and milling yields. Understanding the physical and chemical activity in rice kernels during harvest and processing led to industry adoption of solutions that have improved food quality in the rice industry. Siebenmorgen also developed new research procedures that changed how scientists think about rice. Among these, he pioneered kernel-to-kernel technology that rapidly measures individual kernel properties. He also implemented automated imaging technology and other systems that more quickly and accurately measure and assess rice kernel characteristics. “Dr. Siebenmorgen is recognized in the U.S. rice industry as the leader in post-harvest rice research,” said Keith Glover, president and CEO of Producers Rice Mill, Inc., of Stuttgart, Ark. Dean Oliver, director of Innovation & Technical Services, and Michael Smith, vice president for Quality & Innovation, both of Riceland Foods, co-signed a letter supporting Siebenmorgen’s nominations for the award. 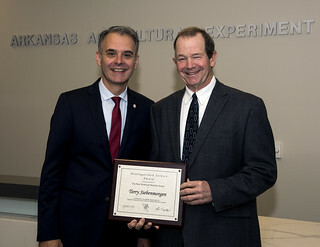 During his career at the University of Arkansas, Siebenmorgen built his research into a broader program, combining the expertise of collaborating food science researchers, laboratory staff and graduate students into the Rice Processing Program, based at the Division of Agriculture’s Arkansas Agricultural Research and Extension Center in Fayetteville. To make sure the program’s research was meeting the needs of the rice industry and consumers, Siebenmorgen recruited food companies from across the U.S. to form the Rice Industry Alliance, which now holds annual meetings to share research and solicit feedback from the industry. “Forming the Rice Industry Alliance was a stroke of genius,” said Nathan McKinney, Arkansas Agricultural Experiment Station assistant director and interim director of the Rice Research and Extension Center in Stuttgart. “Holding the Alliance together and keeping it relevant over 25 years is evidence of remarkable leadership,” McKinney said. Siebenmorgen is quick to share credit for his success. “With any recognition there are so many people to thank,” Siebenmorgen said. “I’m grateful to everyone who has worked with me and supported me for this career-level award,” Siebenmorgen said. The Rice Technical Working Group brings together rice researchers from seven major rice producing states — Arkansas, Califoria, Florida, Louisiana, Mississippi, Missouri and Texas — to encourage a continuous exchange of information, cooperative planning and periodic review of rice research and extension programs. The RTWG also develops research proposals for participating institutions.